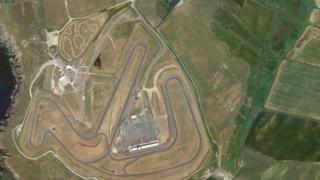 Plans to expand a motor racing circuit could boost the Anglesey economy by £2m a year, its operators have claimed. A bid for improvements to Trac Mon near Aberffraw said it would help stage more and bigger events and attract an extra 40,000 visitors a year. Proposed works include a track redesign and an extension of the paddock, garages, hospitality suite and cafe. Circuit bosses said they need to offer better facilities than competitors in view of its "peripheral" location. Trac Mon had its origins in the late 1980s, when a farmer sought permission to test his rally car on the site of the former Ty Croes military base, according to the Local Democracy Reporting Service. It hosted its first motorcycle race in 1992, was fully licensed in 1997 for both car and motorcycle races and now also hosts a racing school. Expansion would help the circuit "compete and compare favourably" with other motor racing circuits in the UK and internationally, its operators said in a planning application to Anglesey council. "The location of the circuit, whilst it has extraordinary advantages in terms of the setting and atmosphere, is peripheral to the rest of the UK," they added. "Nearly all customers will have to make a longer journey to Anglesey than they would to competitor circuits such as Oulton Park in Cheshire. "Trac Mon therefore needs to offer better facilities and core offer than its competition." Anglesey County Council is expected to consider the application in the coming months. If approved, it is the work could be completed in time for the 2021 racing season.